On the airport bus in Malmö a couple of weeks ago, I was seated in front of a group of twentysomethings whose clipped vowels betrayed their expensive education. I kind of filtered out the first part of their conversation which was all about where they’d been on their weekend in Malmö, but paid a little more attention when they started talking about their future travel plans. And it’s not the first time I have heard somebody expressing this sentiment – in fact, when you do a little reading it becomes apparent that fish does indeed have a bit of a PR problem, especially when it comes to persuading people to cook it. A Google search to complete the phrase “I never cook fish because2 revealed such gems as: “I’ve never been a big fan”; “I don’t know how to”; “whenever I try, it’s gross”; or “it’s so expensive”. People seem to think it is something really difficult to slect or buy, and difficult to cook too, turning into either leather or mush if cooked an instant too long. 1. Buy the freshest fish you can find – don’t get your mind set on salmon tonight and buy any old piece of salmon in the shop – rather change the menu to buy what is freshest. In a whole fish, shiny eyes are important as dull eyes are an indicator of age. Fresh tuna should be deep red, never brown. Fresh salmon should smell like freshly cut cucumber, not “fishy” – and the fat should be white rather than yellow. 2. Buying whole cleaned fish is usually cheaper than fillets – and cooking it is super simple. Sprinkle the cavity with salt and pepper, stuff with crushed garlic and lemon, wrap in oiled aluminium foil and bake in the oven for 30-40 minutes (see my simple whole baked tilapia recipe). 3. Rather slightly under- than overcook fish. The thinner the piece of fish, the shorter the cooking time needed. As soon as the visible flesh of the fish has all changed colour from cooking, most fish (other than very thick tuna or salmon steaks) is done enough. 4. If pan-frying fish fillets, slash and salt the skin side of the fish. Get your frying pan with a little olive oil nice and hot and add the fish skin side down. Press down with an egg lifter to keep the fillet flat. Check for doneness by noting the colour on the side – when the cooked colour comes halfway through the fillet, flip over and cook for another 60 seconds on the other side – and you should have perfect pan-fried fillets (like my pan-fried fish fillets with capers)! 5. If you are a nervous fish-cooking newbie, my favourite foolproof way to cook fish fillets is to salt them and place each fillet in a foil parcel than has been brushed with a little oil. Sprinkle with lemon juice, salt, pepper and garlic and the smear some of your favourite flavouring on top – like pesto, tapenade or tomato paste. Seal the parcel tightly and bake for about 20 minutes at 180C. The parcel keeps the flavour and moisture in so there is no way to dry out the fish (try my mahi mahi parcels with ginger and chilli). Or once you have mastered the art of the foil parcel, you can move on to my easy mustard-crusted baked fish fillets. Use any firm white fish (cod, haddock, hake, kingklip or mahi mahi from sustainable sources are all good) and don’t be shy with the seasoning as the fish itself can be quite bland in flavour. 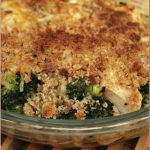 The end result is a moist, flaky fish fillet topped with a flavourful crust – the perfect accompaniment to a bottle of white wine. The white wine in my case was the 2011 Porter Mills Station Chenin Blanc from something called the Oddbins Bloggers’ Case. Wine merchant Oddbins has teamed up with six of the UK’s finest wine bloggers (including my friends Andrew, Tara, David and Paola) and gave them free rein to run rampant around the Oddbins cellars selecting their favourite wines for an exclusive twelve bottle case. Twelve great wines independently chosen by six of the most talented wine writers in the business straight from Oddbins’ shelves: what better endorsement could you ask for? Priced at a budget-friendly £98 for 12 bottles, there is something in there to suit everybody – including the Porter Mills Station Chenin selected by Andrew. He described it as a gentle, herby, ‘cress and rocket’ flavoured palate, perfect for drinking on its own or with food. He also asked me to invent a recipe to match the wine – and here’s what I came up with. Pre-heat the oven to 180C. Lightly oil a shallow ovenproof dish. Mix together the breadcrumbs, garlic, mustard, oil, cheese and seasoning together in a bowl to form a paste. Lay the fish fillets in the shallow dish, divide the past in half and spread half the paste on each fillet, taking care to cover as much of the flesh as possible. Place in the pre-heated oven for 20 minutes or until the fillets are cooked through and flaky. I served mine with roasted butternut squash and brown rice. And what about the wine match? I found the wine on its own to be a fairly simple wine, with the subtle herby flavours that Andrew mentioned and a medium finish – pleasant but not too exciting. 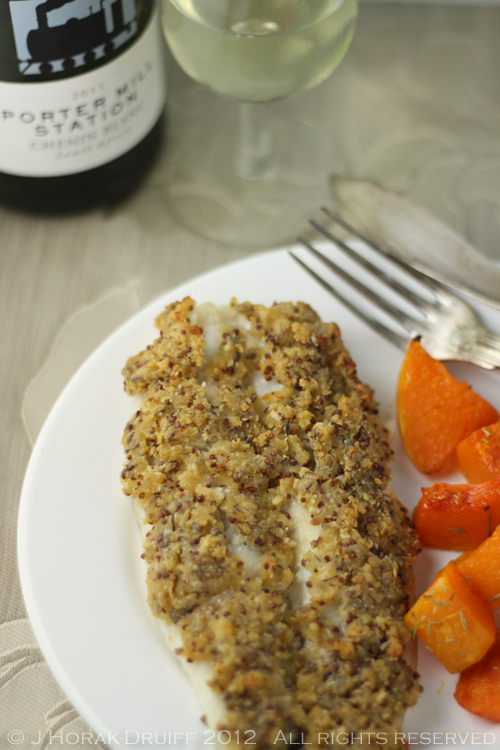 It did work well with the fish though – I think the saltiness in the mustard crust brough out a little more tropical fruit flavours on the palate, without overwhelming the wine. 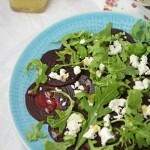 A happy marriage between food and wine – and between food bloggers and wine bloggers! I love fish and shellfish – the fact that Tom is in Stockholm is amazing as he brings home the most freshest salmon. We’ve been enjoying quite a bit of it this summer. 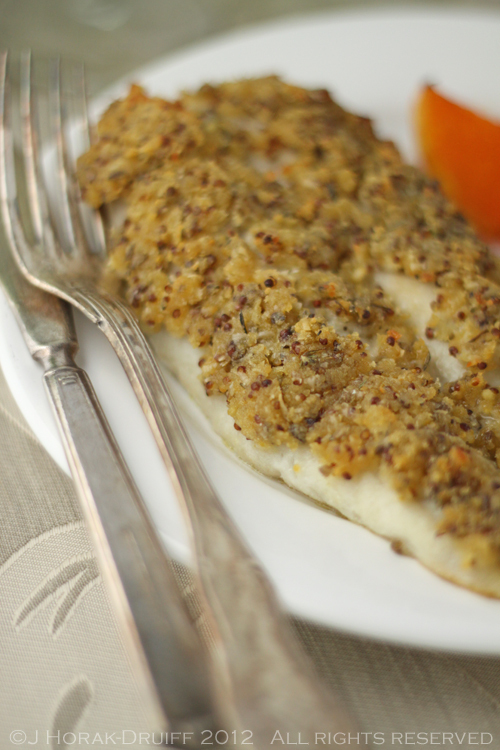 Fish that are “not fishy” are pangasius and tilapia so these are the perfect fish to serve those who are finicky. 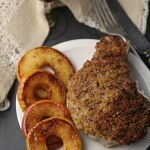 Love your mustard crust here and some awesome tips! This looks lovely and fantastically simple for a weekday dinner! I have to admit to being one of those reluctant fish cooks. Partly due to childhood trauma involving school dinner boiled cod that I am still dealing with!! But foil parcels I can cope with, fish fillets even better! Love the combination of mustard with the fish – would definitely banish the memories of choking down dry flakes of cod in the school dining room. Sounds like a great way to cook fish! I used to bake fish with mustard all the time, but haven’t done it in a while. This fabulous looking dish has reminded me just how good it is! A few comments on fish “Ah’ha!” moments might be interesting. I grew up Irish Catholic in New York City and “fish on Friday” was not exactly a welcome experience despite my mother’s excellent cooking. When I graduated university, I went to work in the out-island Bahamas – Eleuthera to be exact – and was renting a room in a house in a very small town. I’ll never forget when my landlady invited me to dinner one night after purchasing some fish – I’ve no idea what kind but it was a meaty variety like tuna or swordfish – caught that day. It was served simply broiled with what the locals called “sour” – something akin to key limes but a bit more lemony. I was beyond stunned. The mental reaction was something like “This is fish!!!!???? ?” I’ve never looked back. I love, love fish! Great mustard crusting and so earthily delicious. Sigh, I think some people will only eat tuna from cans. Their loss. I love fish and always looking for new ways to prepare. Mustard seems like a very good idea! Thank you for sharing all the tips, it was very informative! “fish does indeed have a bit of a PR problem” Ha ha, this sentence is just too funny! (and so true). I absolutely love fish and don’t understand why some people don’t. One of my regular dishes is caramelized mustard salmon and I think the combination of mustard and fish works everytime. This recipe is definitely something I need to try soon! This dish looks wonderful! I love mustard. A simple yet effective dish that I am looking forward to trying with the wine. OK, so the Chenin is not the finest rendition of the grape that South Africa can produce – but I thought it an excellent bottle to open mid-week, for just a relaxing glass or two. The fact that it is an excellent match to food too is a bonus; this dish you have created sounds superb. I do hope others commenting will try with the wine too. It’s funny isn’t it, the misconceptions people have about fish. I was the same not too many years ago as I was raised with no fish on the menu and the few times I tasted it were not convincing. It took a country like Greece to finally convert me to be a lover of fish. It took a while to progress to where i am today but it agree; fish is not difficult and those mustard encrusted beauties are just gorgeous! I have a bit of an obsession with mustard and you know how I felt about that chicken dish made with it (AMAZING!) so I’ll have to try this too. I’m a bit like Mike. Every Friday throughout childhood we could count on fish sticks. Having a decently prepared fish dish the first time was a shock and a delight. It’s pricey where I am in landlocked Colorado so I don’t eat it anywhere near as much as I would like..but this dish of yours is going into the rotation stat!